TOPICS: Day #1 – Bolivian endemic Blue-throated Macaw. Day #2 – Lear’s Macaw – Parrots International’s support of the ECO program by Kilma Manso (Corn Subsidy Programme). This is the chosen conservation project where the proceeds from this year’s CPC and the 2015 Pennies4Parrots Challenge will be donated. Born in Quebec City, Bennett grew up in Toronto, Ontario, Canada, where he completed a customized zoology/environmental science degree at University of Toronto. He did field work in the Congo for a year, finishing the period with an enlightening two and a half months living with the Mbendjele rainforest pygmies. 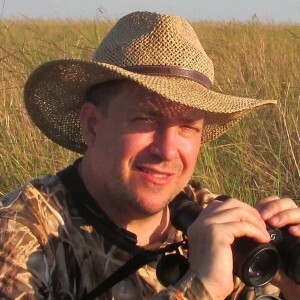 Bennett has lived in Bolivia for over 20 years and raised over 4 million dollars (42 donors) in bird conservation support while directing Asociacíon Armonía. He began the Red-fronted Macaw conservation program and has been supervising the Blue-throated Macaw conservation program for 12 years, resulting in a 27,000 acre reserve for the Macaw and a successful nest box program that has assisted 32 chicks fledge to the wild. Bennett’s bird conservation experience includes: fundraising, bird tour guiding, NGO admin, bird surveys, reserve design, trail creation, presentations, lodge creation and writing, from a birdwatching guide to Bolivia, 19 scientific papers and more proposals than calculable. Bennett speaks (in order of fluency) English, Spanish, Portuguese and French.